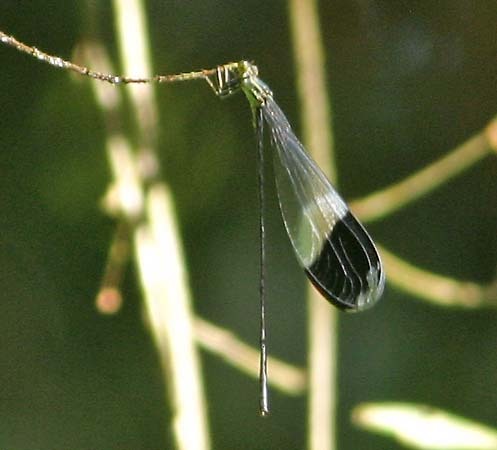 During our late Dec 2007 visit to Costa Rica we were actively aware of odonates, and tried to photograph every one seen in hopes that it could be later identified. I did manage to photograph most of the odonates encountered. Although there are literature and web resources, including an on-line illustrated checklist for La Selva by Wagner et al. (2000), and a Costa Rican checklist by Dennis Paulson, it was a struggle trying to identify these. Paulson also has an on-line collection of worldwide photos and scans, which is very useful if you can get the ode to genera, but my inexperience often precluded even that first step. So I took a shortcut. I asked Tim Manolis and Dennis Paulson for help. Tim has visited Costa Rica briefly before and was able to steer me in the right direction on most, and then Dennis, who once lived in Costa Rica for 14 months, identified all my decent photos to species! This contribution by Dennis Paulson was invaluable, and the help of both Dennis and Tim is greatly appreciated. I initially numbered all the odes for easy reference in identification, and I've left those numbers below (but have excluded those that proved to be duplicates or the photo was just unidentifiable). The numbers follow the progress of our trip from the Atlantic lowlands to the conclusion on the Osa Peninsula of the Pacific southwest. 1. The first ode we saw was a saddlebags [Tramea] that immediately reminded us of Striped Saddlebags T. calverti, which we had just seen in California in October as a state rarity. Here, this saddlebags was common in swarms over open fields between La Selva and Puerto Viejo (we walked this several mile stretch). 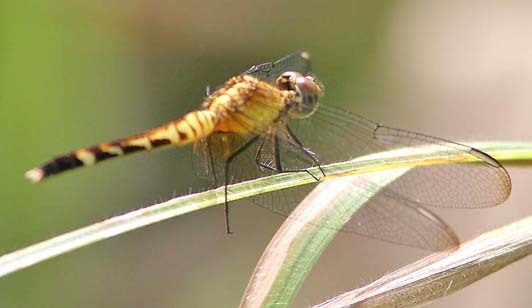 Both Dennis Paulson and Tim Manolis have confirmed this is, indeed, Striped Saddlebags; a female in the photo. 2. 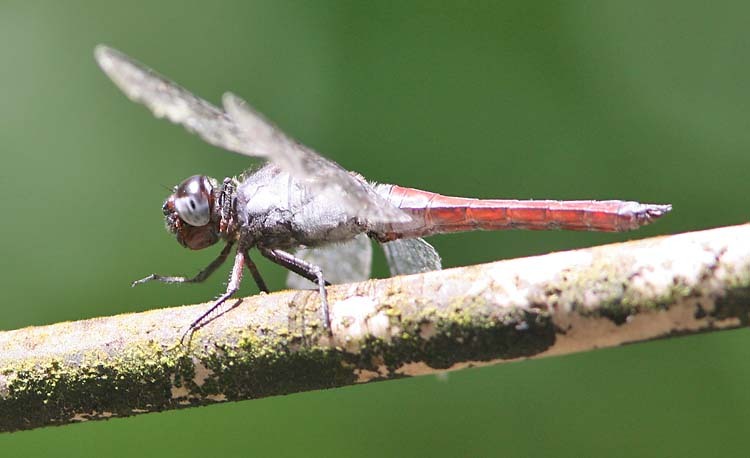 We finally saw a dragonfly in the fields near Puerto Viejo that was not a saddlebags we already knew. This was perched, mid-sized skimmer-like dragonfly, and appeared to be a female. Dennis Paulson has identified this as a female Erythrodiplax fervida Red-mantled Dragonlet. I also photographed one on the Osa Peninsula (title photo, above). 3. This was a huge 'helicopter' damsel well inside the forest at La Selva. It was first spotted in flight, then landed for this one shot before taking off again. Given is huge size, we assumed it was Giant Helicopter Megaloprepus caerulatus. Paulson has confirmed this i.d. 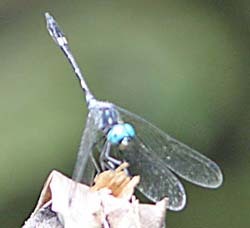 of this male; among other things, this is the only helicopter with blue in the wings. This is the largest damselfly in the world and very impressive! Silsby (2001) calls them "forest giants" but Paulson says everyone in Costa Rica calls them "helicopters" (or the Spanish equivalent). We had another at ~600m along the Los Palmas Trail, Braulio Carrillo NP (no photos of that one). 4. This was inside the forest along the Los Palmas Trail at ~600m elevation. I show two photos here (right & below). 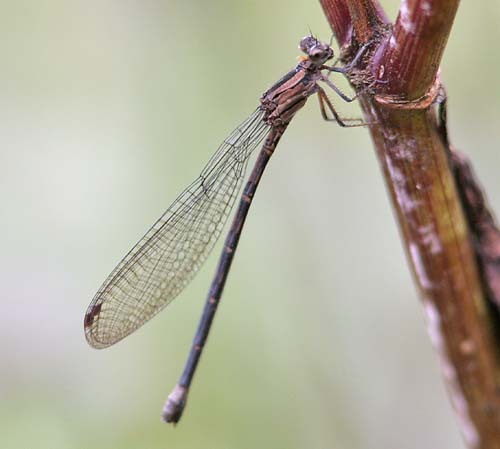 It was a large damsel that holds the wings out, recalling a huge spreadwing. Paulson identifies it as Philogenia carrillica, which has no English name as yet. Male is below; female to the right. 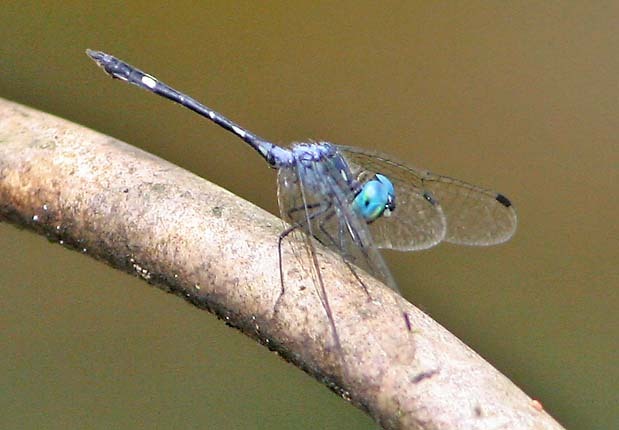 Philogenia is a genus of (mostly) Central America damsels, called flatwings, in the family Megapodagrionidae. Dennis says that so far P. carrillica is known only from the foothills of the Atlantic slope from southern Honduras to Costa Rica (by may be expected in eastern Panama). 5. This small damsel appeared to be a female Argia dancer. Several were at roadside about where the main highway crosses the highest ridge in Braulio Carrillo NP, at perhaps 700-800m elevation. Paulson says it is most likely Argia underwoodi [no English name], especially if near a waterfall. There was a steep drop here from the road edge where water ran through a culvert. Perhaps that qualifies as a waterfall from the dancer's perspective? 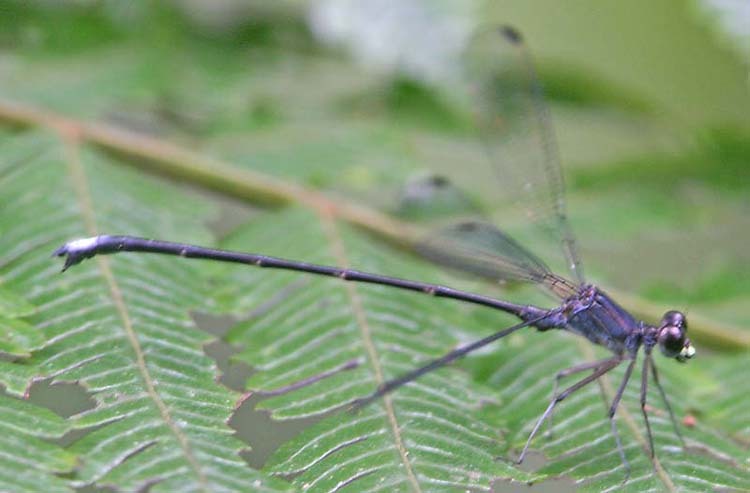 There are a huge number of Argia dancers in Costa Rica, some of them probably undescribed species (see below), and their taxonomy has not yet been adequately sorted out. 6. This ode (below) was in the bare dirt parking lot of a roadside restaurant at the town of Buenos Aires. This is a town in the Pacific lowlands or low foothills, and we stopped for lunch in our taxi enroute from Savegre in the mountains to the Osa Peninsula. 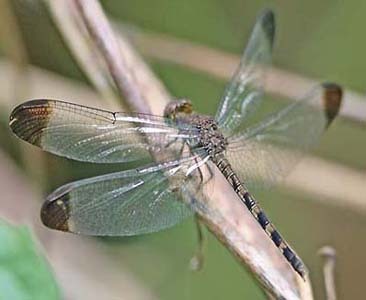 It seemed to be a libellulid that perched on the dirt but made short foraging flights at the edge of the open-air cafe. 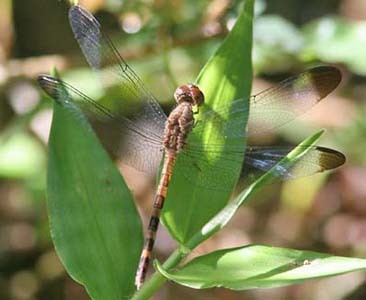 Paulson identifies it as a male Brown Setwing Dythemis sterilis. He said, however, that he doesn't "usually think of them perching on the ground, but there it is." 7. This was the common damsel in the forest behind the lodge. It seemed to be a bright, colorful Argia dancer. 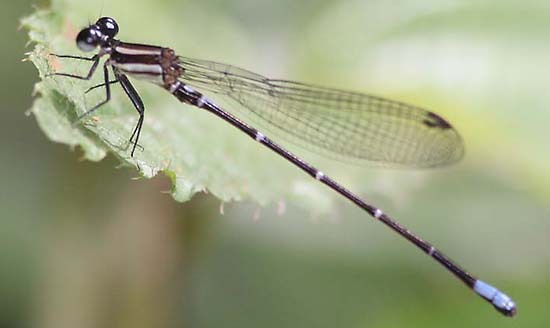 Paulson says that he recognizes this as a very common species of Argia dancer from the Osa Peninsula, but "probably not a described species." In other words, it is likely this lovely little damsel has not yet been described to science or, if it has, has not been properly placed in the right category. For now, it is a dancer with no name. 8 a & b: these perchers were common in the forest at Rio Tigre. Paulson and Manolis identify them as Common Woodskimmer Uracis imbuta Shown below are two females, with the older one on the left. 9. This was a perched skimmer than reminded me a lot of Roseate Skimmer, but perhaps the abdomen was a bit redder and less pink-purple? It seems likely to be an Orthemis. It was out in open fields outside the forest, but near Rio Tigre. Paulson agrees it is a male Orthemis, but that one needs to see the face and thorax better for i.d. 10. At mid-day on 26 Dec, we found a pond in the forest – considered a backwater 'lagoon' of the river – that hosted clouds of odes. One branch seemed to have 4 species, and I got photos of 3 of them. This one was a small, bright, green-eyed percher (left and below). Paulson identifies it as Spine-bellied Dryad Nephepeltia phryne. 11 and 12. 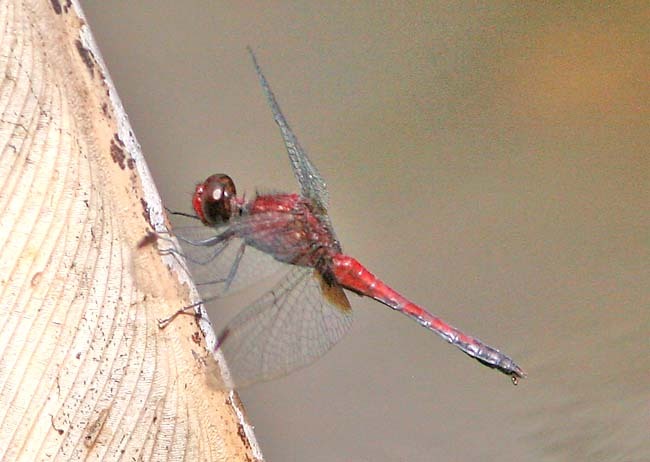 The same branch used by the green-eyed beauty in #10 was also often the perch for two rather bright red skimmers. The shot above shows them both, and then each is shown below. #11 is large and reminded me very much of Neon Skimmer from California. #12 (right above and second below) was decidedly smaller and has a black tip to abdomen. 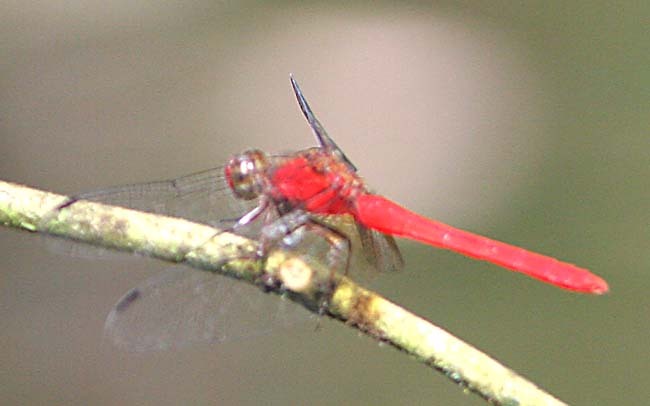 Paulson says the big red male (#11) is Northern (or Central American) Redskimmer Rhodopygia hinei. He says these are just about the brightest red dragonflies in the world. 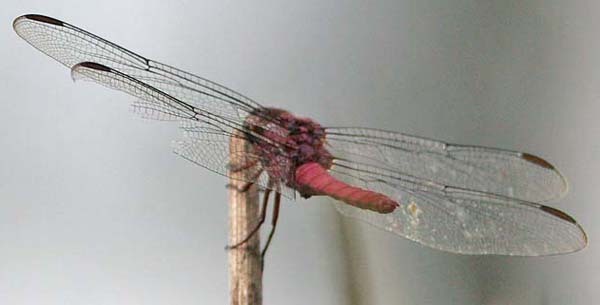 The other Rhodopygia redskimmers are found in South America. The smaller red male (#12) is Red-faced Dragonlet Erythrodiplax fusca. Paulson says that Central American populations lack the blue abdominal pruinosity that characterizes most populations; it as yet to be determined whether this may indicate these should be considered a separate species. 13. Finally, a largish dragon was often foraging in flight in front of our bungalow at Rio Tigre. It was colorful, with a dark purplish-black thorax and a bright maroon abdomen. For lack of a name, we called it "Rita's Lovely Dragon," because it seemed to be 'visiting' her as show was reading. Initially I despaired of photos, but a couple days later I found that it, or another, was often perched in the front of the lodge. It tended to perch high — well above eye-level — and required standing on a bench to get this shot (below). 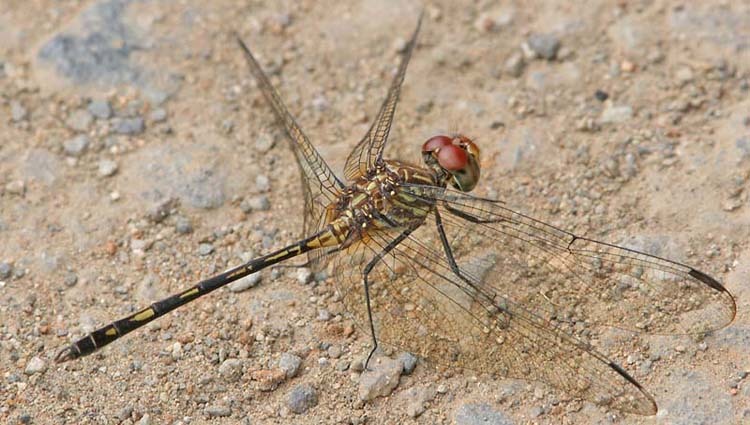 Paulson has now identified it for us: a male Silver-sided Skimmer Libellula herculea. Silsby, J. 2001. 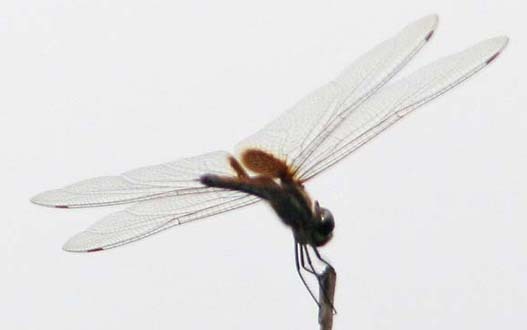 Dragonflies of the World. Smithsonian Instit. Press, Washington, D.C.
Wagner, D. L, D. Paulson, P. Naskrecki, C. Esquivel, and A. Ramírez. 2000. 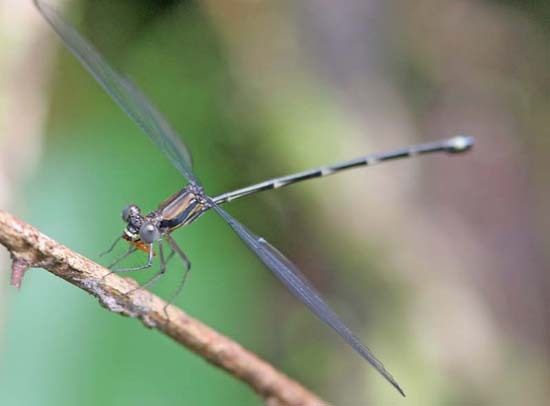 Dragonflies and damselflies of La Selva: an illustrated checklist of the odonata of La Selva Biological Station, Costa Rica. On-line.